Today: How can you get your hands on the freshest, fluffiest doughnut around? You can wake up at 6 AM and stand in line outside your local doughnut establishment, or you can follow Erin's lead and make them yourself. Doughnuts, for me, represent absolute perfection. Don’t get me wrong: Pie is my number one; cake is near the top of my list; and I’ve never met a cookie I didn’t like. But doughnuts…there isn’t much in this world that’s better than a good -- no, a GREAT -- doughnut. Sure, they can be doused in sugary glaze and topped generously with sprinkles, but the dough itself isn’t too sweet -- it’s just yeasty and soft and pillowy and perfect. It’s the ideal canvas for endless variations to suit your whims. The real reason doughnuts are so wonderful to me is the connection they have to my past. My grandmother lived in a house built by my great-great-great grandparents: a real little house on the prairie in the middle of nowhere, Kansas. When my grandma was a kid, it was her grandma’s house; same for my dad; and luckily, for me too. Along with the wonderful history of the place itself, the house was home to a lot of our own food history. One day, my grandma pulled out a pretty little yellow tin recipe box. The paint was chipped, but it was lovely and chock-full of my great-great grandma’s recipes. This includes the tattered old card that contained the handwritten recipe for these doughnuts. 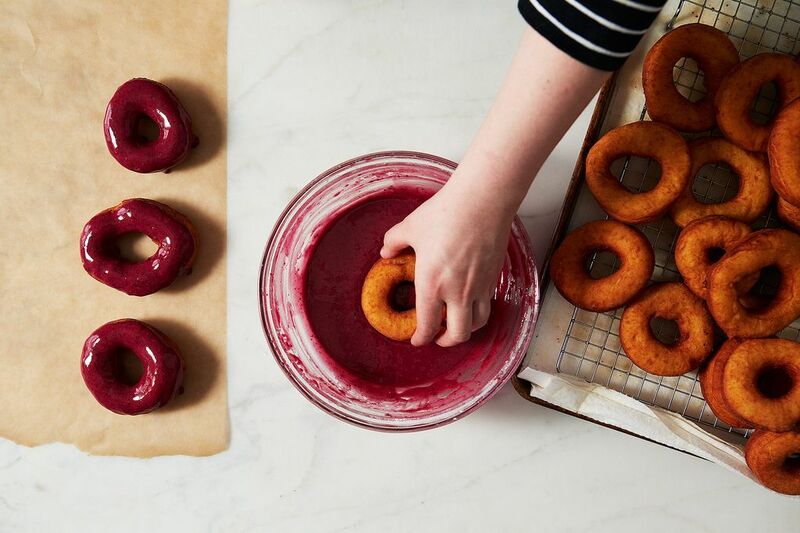 When a recipe is good, it stands the test of time -- and these doughnuts do just that. If you need more proof (or aren’t overly sentimental) of doughnuts’ greatness, there’s this: You’re allowed, even encouraged, to eat them for breakfast. Cake and cookies can’t really say that. So, let’s break it down, shall we? Time for a little doughnut history, y'all. The concept of the doughnut has origins in Dutch, Italian, French, and Russian baking -- all cultures that mastered dough (especially of the sweet variety) and weren’t afraid of frying. Archeologists have even found fossilized bits of what appear to be pieces of fried dough across prehistoric Native American grounds. From this time on, there was much heated debate about how doughnuts got the hole in the center -- some say it was a nod to the steering wheel of a ship, others say it was to avoid undercooking the center. Whatever the reason, doughnuts took off; cheap, fast, and easy to produce, they became a primary snack of American troops during the first World War. The hungry boys came home seeking more doughnuts, the first mechanized doughnut machine was built in 1920, and the rest, they say, is history. Doughnuts were prominent throughout the United States, and were so inexpensive to produce that they were a food of the everyman, an attainable treat even during times of poverty or hardship. Now, the reason for this little history lesson is the name. “Doughnut” is the traditional, (and if I may humbly say, accurate) name of these delicious treats. The word “donut” was coined when manufacturers began to try to market the food overseas -- they thought a shorter word might be catchier and easier to remember for those who’d never seen it. More: Doughnut-cha want more doughnut history? While I’m particularly fond of the classic yeasted doughnut (and that’s the recipe I’ve included here), there are many different types. Yeasted doughnuts are made from a lightly sweetened yeasted dough that is deep-fried. These doughnuts possess a tender exterior and a fluffy interior. Twists consist of two pieces of yeasted doughnut dough twisted together prior to being fried and glazed. This is worth pointing out because it opens a whole host of fun shaping opportunities for yeasted dough (like my cinnamon roll doughnuts below). Filled doughnuts are most commonly made from yeasted dough because it produces an airy interior which easily makes room for filling. This category includes jelly-filled Berliners, cream-filled or fruit-stuffed doughnuts, Boston Cream, and so on. Long Johns are a long, rectangular doughnut made from yeasted dough that often boast a thicker schmear of glaze and/or a filling. Cake doughnuts are made from a looser batter/dough that is leavened with chemical leavener (baking powder or baking soda). If the batter is loose, these doughnuts may need to be piped rather than cut. These doughnuts have a firmer exterior and a tighter crumb structure on the interior, and they can be baked instead of fried. Crullers are piped doughnuts. While they’re most often thought of as ring-shaped, they can also be made into long rectangles. American crullers are generally made with cake doughnut batter. French crullers are made with pâte à choux dough. 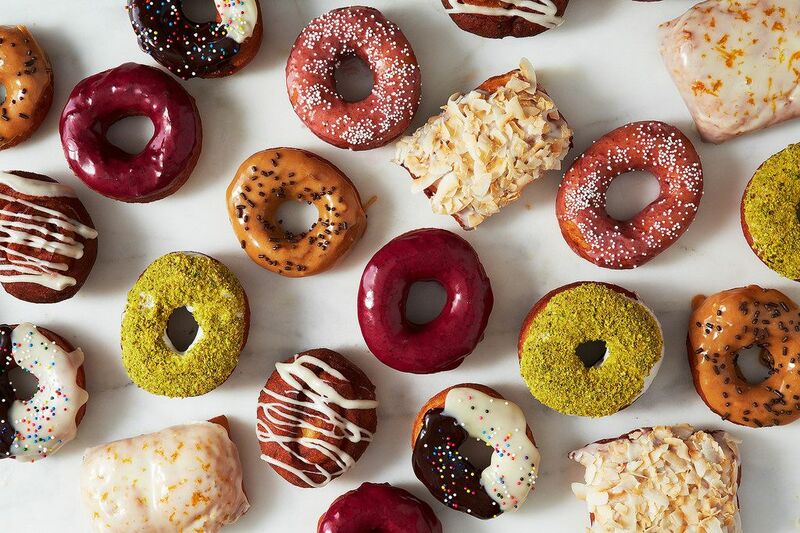 Old-fashioned doughnuts are a type of cake doughnut that is piped or scooped, giving it an irregular shape and therefore, a crispier outer crust. Don’t forget the street foods and snacks of the world. This includes bomboloni (often made with brioche dough) and zeppoles of Italy, Norway’s cardamom-scented smultringer, the jelly filled packzi of Poland, Spain’s churros, Latin America’s sopapillas, dozens of German variations, and of course the favorite in New Orleans, the beignet. In short, there’s a heck of a lot of doughnuts out there. Nowadays, the sky’s the limit. The ingredient list for doughnuts is relatively small, but it’s important to understand the ingredients and how they are manipulated to create the end result. Flour provides structure -- most recipes will veer towards all-purpose, though specialty recipes may call for cake flour or bread flour if a specific result is trying to be achieved (more tenderness and more structure, respectively). The liquid can simply be water, but it often includes some form of dairy -- whether it’s milk, cream, sour cream, buttermilk, melted butter, or evaporated milk. These liquids help to tenderize the dough as well as provide richness. Yeasted doughnuts often contain very little (or even no) sugar inside the dough, while cake doughnuts often boast a more significant amount. A leavener of some kind (whether yeast or chemical), and salt are also a must. Finally, any number of flavoring agents, from dried spices, citrus zest, fresh fruit, juices, cocoa, nuts, maple, etc. -- and that’s just to name a few. Yeasted dough needs more intense mixing to build structure. Follow the recipe’s guidelines, but generally yeasted doughnut dough should be mixed on low speed until the dough comes together, then mixed on medium speed to strengthen gluten strands. The dough is not mixed as intensely as brioche -- the whole process will take only a few minutes -- but much like brioche dough, yeasted doughnut doughs can be quite sticky and can require oiled hands or a sprinkling of flour before handling. Cake doughnut batter, on the other hand, should be mixed minimally to ensure tenderness. Let it rise (when applicable). This tidbit doesn’t apply to cake doughnut batters, but when yeast is involved, it’s really important to allow for enough rise time. Generally, this means 1 to 2 hours of bulk fermentation (letting the entire dough rise) and about 30 minutes after shaping. 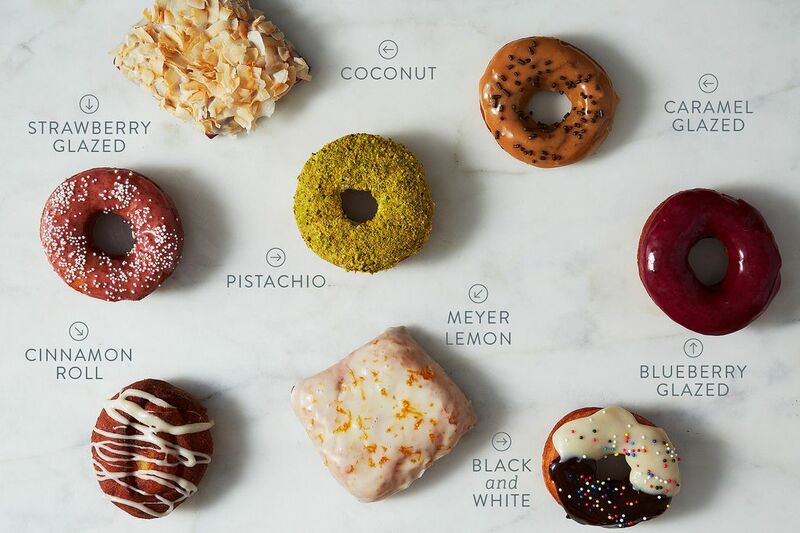 This gets to be a problem for impatient doughnut lovers (isn’t that all of us?). There is a solution. Instead of using warm water to mix the dough, use room temperature water and refrigerate the dough immediately after mixing. 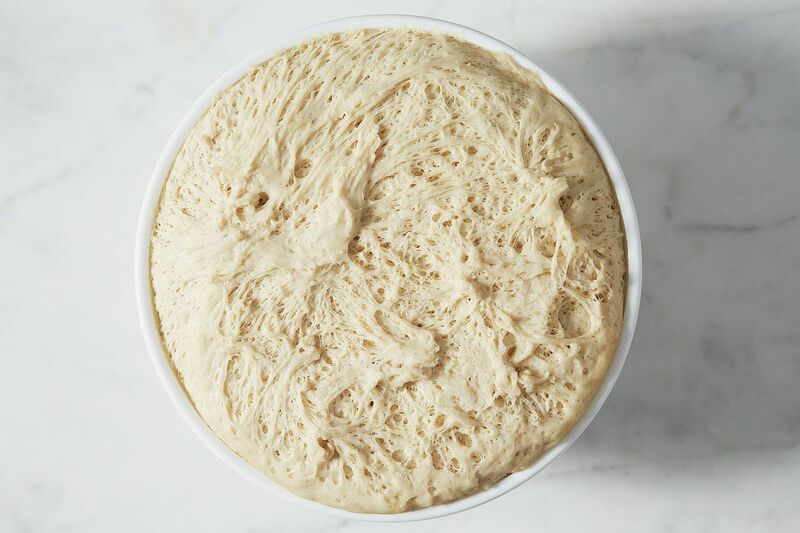 Under refrigeration, the dough continues to rise, just much more slowly. This means you can mix the dough up to 12 hours ahead, let it rise slowly overnight, and wake up ready to fry in the AM. Doughnuts are rustic but it’s still important to keep shaping in mind because this is where they can go a bit awry. 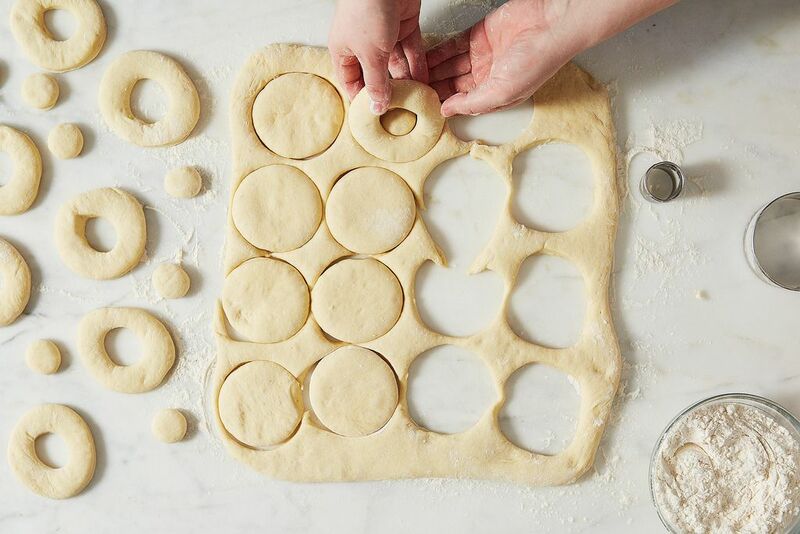 A doughnut cutter is great, but you can improvise if you don’t have one: For a long time, I used a circle cookie cutter and then the base of a large pastry tip. It’s important to make sure the hole itself is large enough -- if it’s too small, it will “fill in” when the dough hits the fryer. I also like to cut square doughnuts (no scraps! ), using just a pastry wheel -- 2 inches x 2 inches is a good base size (this same technique works for Long Johns). 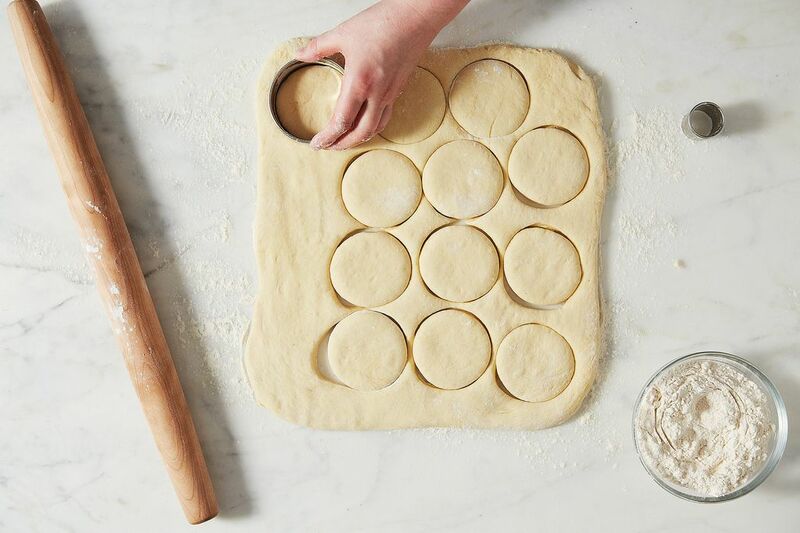 When you transfer the dough to the oil, do so carefully: It’s easy to accidentally squish the hole shut or stretch the doughnut into an oblong shape. If the doughnut batter is to be piped, it can be piped directly into the hot oil. Since that can be pretty scary, piping onto squares of parchment can alleviate the fear. When you go to fry, the doughnut will release itself from the parchment, and you just have to remove the parchment from the oil with tongs. Fry those puppies -- because you’re worth it. 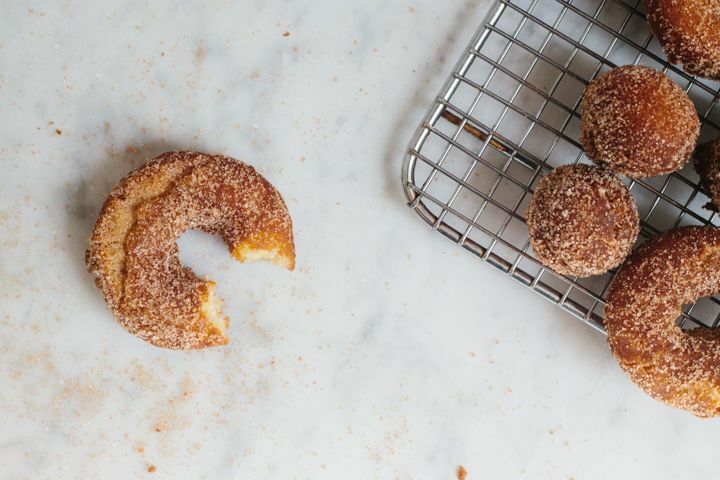 Baked doughnuts are now officially a thing, but let’s be honest: Ain’t nothin’ like the real thing, baby. If you have one, use a deep-fry thermometer to test the oil and help regulate the temperature -- around 350° F is best. If you don’t have one, do it the way my great-great grandma did: Throw a doughnut hole in and see if it sizzles and rises to the surface. If it does, you’re good to go. Remember that if the oil is too hot, the doughnuts will brown too quickly and the center may remain raw. If the oil is too cold, the dough will absorb a large quantity of oil and be greasy upon cooling. The perfect doughnut will be evenly golden brown on both sides and pale in the center. My favorite draining system for doughnuts is simple: several layers of absorbent paper towels on a baking sheet. When it gets too saturated, toss the top layers and reveal the fresh ones underneath. Some folks opt for a cooling rack set on top paper towels. Either way is fine, just make sure to use a spider or slotted spoon to remove the doughnuts to start the draining process off right. Learn how and when to apply garnishes and finishes. For powdered sugar, cinnamon sugar, or other sugared doughnuts, remove the doughnuts from the oil and drain as desired. After 30 seconds to 1 minute of cooling, toss the doughnuts in the sugar. If you wait for the doughnuts to cool for too long, the sugar won’t stick to the doughnuts. Also, remember that powdered sugar will eventually absorb into the doughnuts, so you’ll either need to toss them again or you should plan on serving them immediately. For a thin, all over glaze (think classic glazed doughnuts), let the doughnuts cool for 3 to 4 minutes, then transfer to a wire rack. Pour the glaze evenly over, fully coating the doughnuts. Let set. 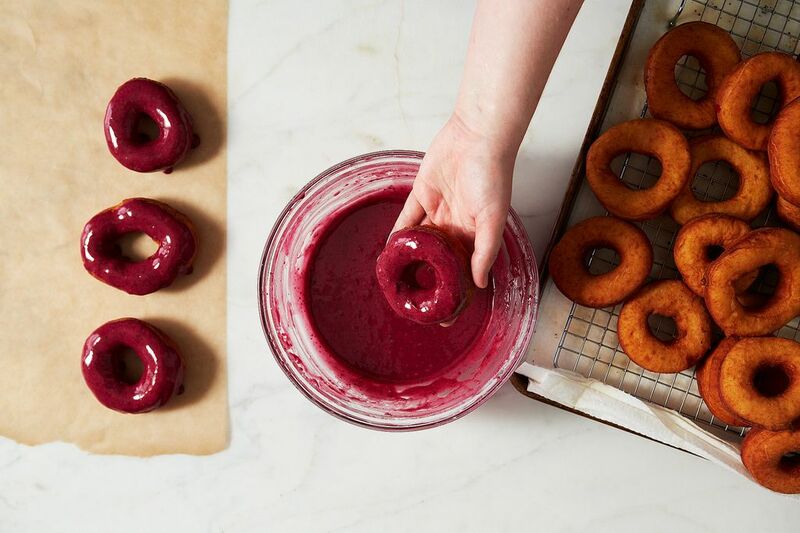 For a thicker glaze (think top of the doughnut only), let the doughnuts cool for 4 to 5 minutes, then dip the doughnuts in the glaze. The thinner the glaze, the more it will run (yum). The thicker the glaze, the more precise it will be. Apply any garnishes to the top of the glaze before it sets, which can take anywhere from 2 to 10 minutes depending on the glaze. The best doughnuts are fresh doughnuts. If you've ever lived anywhere near a Krispy Kreme, you understand. When that magical light went on, it was absolutely worth it to pull over with a total screech to get at those piping hot doughnuts. But even at room temperature, doughnuts are best the same day. If you must, keep them in airtight containers overnight, and enjoy round two. Powdered: Toss in powdered sugar or cinnamon sugar. Glazed: Mix 3/4 cup powdered sugar, 3 to 4 tablespoons heavy cream or milk (enough to make a runny glaze), and 1/2 teaspoon vanilla (optional). Chocolate-Glazed: Mix 3/4 cup powdered sugar, 2 tablespoons dark cocoa powder, and 4 to 5 tablespoons milk or cream. 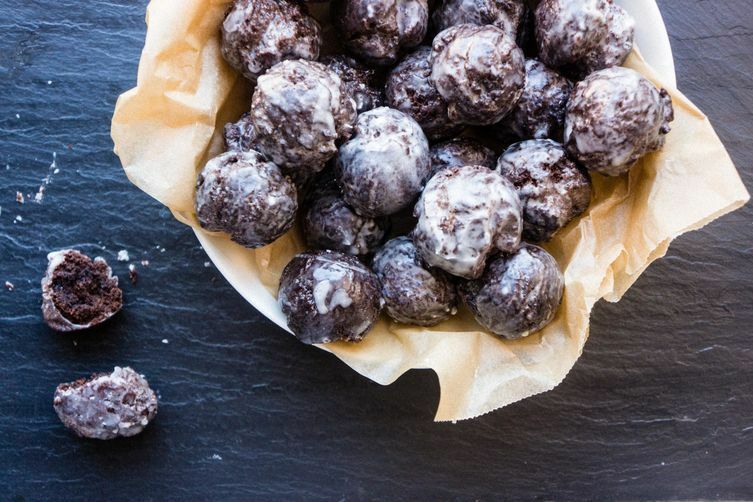 Chocolate-Coated: Dip doughnuts in tempered chocolate thinned with 1 to 2 tablespoons vegetable oil. Fruit-Glazed: Mix 1 cup powdered sugar and 1/4 cup fruit purée. Violet-Glazed: Mix 1 cup powdered sugar, 1/4 cup cream or milk, and 1 teaspoon violet extract. Garnish with candied violets. Pistachio: Glaze donuts with basic glaze, then press in chopped toasted pistachios. Coconut: Glaze with coconut glaze (1 cup powdered sugar, 1/4 cup coconut milk, and 1/2 teaspoon vanilla), and press in toasted coconut flakes. Black and White: Make a dark chocolate ganache with 1 cup chopped dark chocolate and 1/2 cup heavy cream. Make a white chocolate ganache with 1 cup chopped white chocolate with 1/4 cup heavy cream. Glaze half the doughnut with the chocolate glaze and half with the white glaze. Caramel-Glazed: Melt 1 cup of caramel candies with 1/3 cup heavy cream in the microwave in 10-second blasts until fully melted. Thin the glaze with additional milk or cream as needed to get a pourable glaze. Meyer Lemon: Mix 1 cup powdered sugar with the zest and juice of 1 Meyer lemon, then add enough milk to form a pourable glaze. 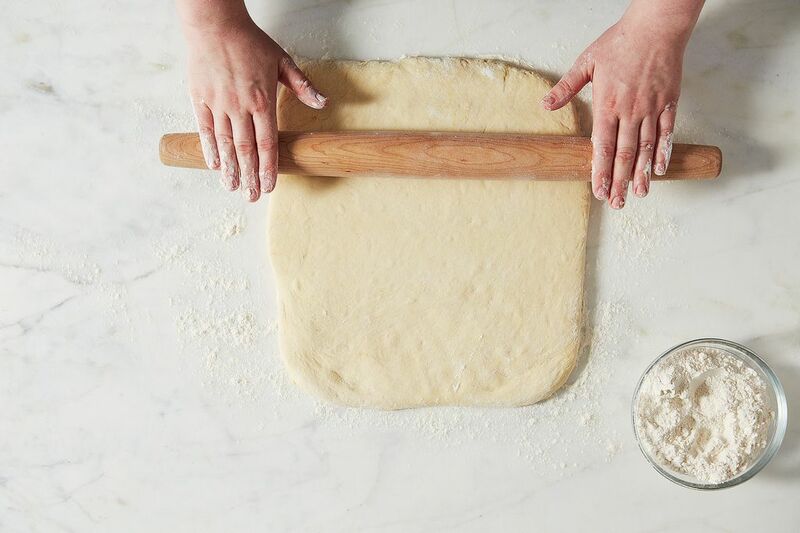 Cinnamon Roll: Roll out the dough to 1/4-inch thick. Mix together 1 stick melted butter with 1 cup granulated sugar and 2 tablespoons ground cinnamon. Spread the mixture evenly all over the dough, then roll tightly into a cylinder. Cut into 1 inch-thick pieces, then fry until golden brown. Glaze with basic glaze. What youmhave to remember is that real doughnuts are yeast raised and you use VERY LITTLE to NO SUGAR in the dough. Donuts made in the U.S. today all mostly made with plain bread dough with a lot (LOT) of added sugar. These "bakery shop" doughnuts can/could/should make anyone gag. SUGAR in the U.S. is the number one (1) ruination of most all food consumed today. Also - remember that over time, every ingredient in cooking has been modified and changed to make things quicker and easier. When buying supplies for baking, ALWAYS bake from scratch only and find and use the ingredients that as closely resemble those your mother or grandmother could buy. Real butter and NO margarine - Canned condensed milk to replace raw milk from earlier times - one jumbo egg today is equal to one small egg in the past. Think about what used to be or buy only cookbooks published before 1950. When we went to convenience foods; and ingrediants, we went to an obese nation of sugar pigs. Erin, this article is all sorts of amazing. Can I increase the amount of sugar in the dough? I felt like it needed to be a little sweeter. They also came out too chewy. Did I mix too long? or not long enough? I have the same question. Could you answer the question please ? Sorry to take up further space but permit me one more correction, as one should not go by memory. It wasn't Washington Irving, but Nathaniel Hawthorne who referred to the doughnut as a Puritan dish, and the term he used (circa-1860 at any rate) was "Puritan dainty". In my view, the new England/Puritan tradition is separable culturally and geographically from the New York/Hudson Valley Dutch one and this reference to Puritans reinforces an old English origin for the dish. Sorry, not "fried bread", but "fried dough" it was in those Hudson Valley towns. I believe these are direct descendants of the Dutch oely-koeken (different spellings) that are thought to be at the bottom of the doughnut, but I think in fact these are different traditions. Washington Irving in an 1860 book referred to the doughnut and some other well-known American pies and pastries as a "Puritan delicacy", which suggests again an English origin. The famous dough boy as in Pillsbury dough boy surely is connected as well? Anyway all very interesting and your recipes look great. We are very proud in Canada of the Tim Horton Donut chain which has become part of Canadiana now. I always felt a British origin made sense and that doughnuts were an obscure regional food brought over on the Mayflower. Like other English-origin foods, they simply achieved more prominence here than in the Old Country. It is unlikely in my view a British gentlewoman in 1800 would have submitted to any influence from America in her cooking. Virtually no American cookbooks had yet been written, and as a recent colony I don't think the English would in any case take inspiration from America in cooking mores. (That came in time, but not then and not in this way). I've had "fried bread" in small towns along the Hudson River in New York State and it isn't really like a donut. I recall it as more the size of a piece of foccacia bread, kind of flat or at least irregular shaped. "Dow" would have been an alternate spelling for dough, this was a time when spelling was not regularized. I think too dough boy was another old British confection and I'd think there is some connection probably to the donut or doughnut. No question the Americans perfected it and made it what it is today but still the Baroness's recipe is pretty close to some donuts you can still buy today. Very interesting! You know, i'm from argentina and here they're also called churros! Even what you describe as 'twists' are often sold as churros, but really i didn't know they were made with the same kind of dough as donuts (since churros are closer to crullers). I'll try your recipe to make twists (since i don't have a churrera) and see how it goes! Absolutely awesome article.....puts it all in nice, neat organized shape ( for me at least!). Printing it out to keep on hand. Thanks!! It says vegetable oil for frying, Any specific kind? Any kind of neutral frying oil is fine: corn, canola, vegetable, peanut, etc! Can I leave the egg out and use soy milk to make vegan?? I haven't tried it, but I imagine it should work. I would recommend using an egg replacer rather than leaving the egg out entirely. Let me know how it is! You are a baking goddess Erin McDowell.